Posted on September 20, 2017 . by Patrick Johnstone. Leave a comment. The September 18 meeting of Council was an all-caps-worthy BIG ONE, and I pretty much am going to not talk about the BIG topic, which was the Public Hearing, for reasons below. But before that started, we went through a few Agenda items. We have had a couple of changes in representatives to City Committees, both in the persons representing another group on the City Committee. This happens once in a while, but Council officially has to approve, which we did. The City has about $160 Million in the bank, mostly with the Municipal Finance Authority. Note, most of this is restricted money (that is, we have already committed it to a specific purpose, such as future sewer upgrades or road projects). This is our regular reporting on how the investments are doing, which I would characterize as “pretty good”. I’ve already opined about this fire escape. I recognize the need for it to exist, and can see the engineering rationale for it, but am frustrated about how some siloed thinking in City Hall resulted in a design that was incongruous with the great planning and design work being done on the Front Street Mews. I feel a solution that fit the bigger vision could have been found through a more collaborative design approach. This report outlines a better approach moving forward, and we can hopefully use this experience to enhance how we develop our public spaces. There is a piece of surplus City land in Queensborough with an adjacent unopened road portion that only makes sense to develop in concert with the commercial properties. The Community Plan designates this property for commercial use, which is not something the City is likely to do. This report outlines the negotiations that have taken place to sell the lands so that they can be developed and start contributing to the community through retail opportunities, jobs and taxes. This is a pretty exciting pilot project the City is proposing to undertake in collaboration with BCIT and their Smart Grid Microgrid Applied Research Team. They are researching the implementation of curbside charging electric vehicles, and want to testbed some technologies that would connect EV chargers to existing City electrical infrastructure like streetlights, in order to develop reliable engineering specifications and systems for wider adoption of the idea. This could, in the short term, result in up to a dozen more Level 2 public charging station in the City, and contribute engineering designs and data to the seemingly inevitable transition towards a fully electrical transportation system towards the middle of the Century. The oldest extant building in Queensborough is privately owned, and threatened with demolition as the landowner wishes to redevelop the property. The City is limited in what we can do to prevent this, but we can develop incentives to make it easier for the developer to maintain the building or portions of it through a Heritage Restoration Agreement. This temporary order protects the building from destruction while staff work with the proponent to find if these opportunities exist. This work out of the way, we started our Public Hearing, which had three items, eliciting (in order), one, fourteen, and one delegations. All three items were referred to the resumed Council Meeting following the Public Hearing, and all three were given Third Reading. They were not, however, Adopted, because there needs to be some procedural work done by staff between Third Reading and Adoption. Because of the quasi-judicial nature of the Public Hearing process, I don’t want to get into a discussion about the items between now and formal Adoption. For that reason, I am only describing the items at a high level here and will reserve longer discussion of them until after (and if) they are Adopted by Council. This Bylaw changes the zoning for a piece of land at the east end of Downtown New West to allow its use for a housing project that will combine housing adapted for people with disabilities with family-friendly townhouses, all operated by a not-for-profit to keep them affordable (through a separate housing agreement with the City). This Bylaw would make Our City 2041 the Official Community Plan for the City, after more than three years of public consultation, Council wrangling, and staff work. Council moved to give the Bylaw Third Reading. THAT Council direct staff to explore additional locations that could be designated Residential – Infill Townhouse as part of a two year Townhouse and Rowhouse Monitoring Program, and include the outcome in a proposed Land Use Designation Map update at the conclusion of the Program, should the OCP be adopted. This Bylaw would make changes to our Zoning Bylaw to facilitate many of the changes discussed in the Official Community Plan, including setting parameters around which laneway and carriage houses will be introduced ot our existing Single Family Neighbourhoods. Council moved to give the Bylaw Third Reading. This Sign Bylaw Variance would allow a new anchor tenant at the Royal City Centre to affix signage to the outside of the building that is congruent with the exiting signage. Even with our new and refreshed sign bylaw, there are exceptions, including one of only two indoor malls in New Westminster, and a variance is best way to manage this type of application. There was no correspondence and no-one came to speak on this item, and Council approved the variance. This Bylaw formalizes a cost sharing agreement between a group of property owners in Queensborough and the City for some streetscape improvements on their block. It was adopted by Council, making it the Law of the Land. Posted on September 13, 2017 . by Patrick Johnstone. Leave a comment. Posted on September 5, 2017 . by Patrick Johnstone. 2 Comments. Posted on September 3, 2017 September 3, 2017 . by Patrick Johnstone. Leave a comment. Last week in Council, we had an Agenda item entitled “Procedure for Offensive Correspondence Received as part of a Legislated Public Process”. I made mention of it in my Council report, but wanted to put a little more context around it, as it seems topical to events local and around the planet right now. The background is thus: City Council has some legislated responsibility to “receive” public comment on issues of public interest through Public Hearings, Opportunities to be Heard, and some seldom-exercised quasi-judicial duties we have. To “receive” the correspondence generally means to acknowledge publically that we have received it and had time to review it, and then to enter the correspondence into the Public Record so the public has a right to see what evidence we used to inform our decision about the issue. This spring, we had application for a temporary use zoning amendment from a community group, and received some correspondence opposing that application that was (in my opinion) offensive. It contained uninformed and hateful comments about people living, working, and worshipping in our community and included links to inflammatory YouTube videos by the most ignorant and intolerant fringes of our society. During the Public Hearing, when the correspondence was to be received, I asked if it was possible for this correspondence to not be received. Having read it, I did not want it to be entered into the public record, as this would result in the City disseminating hateful speech. I also did not want to leave open an invitation for further bigoted speech to be used in part of our consideration for a land use amendments – at some point you need to say no to racism and bigotry. At the time, our City Clerk (whose job it is to assure that the procedures followed by Council are legally on the up-and-up) suggested that not receiving a specific piece of correspondence would be irregular, and could potentially result in a legal challenge that may put the application in jeopardy – unintentionally impacting the applicants and empowering the person opposed to them. This seemed a suboptimal result, so I agreed along with Council to receive the correspondence. However, I also asked that we get a legal opinion and strategy to deal with offensive correspondence received as part of a Public Hearing process in the future. The result, this week, is that staff have outlined a procedure where all correspondence will be received, and delivered to Council, but correspondence considered offensive or inflammatory will not be entered into the Public Record, except in noting that it has been received and redacted. In the end, an interested member of the public could FOI the correspondence that was redacted, but we are not required to disseminate this hate to the general public. I’m pretty happy with this compromise. 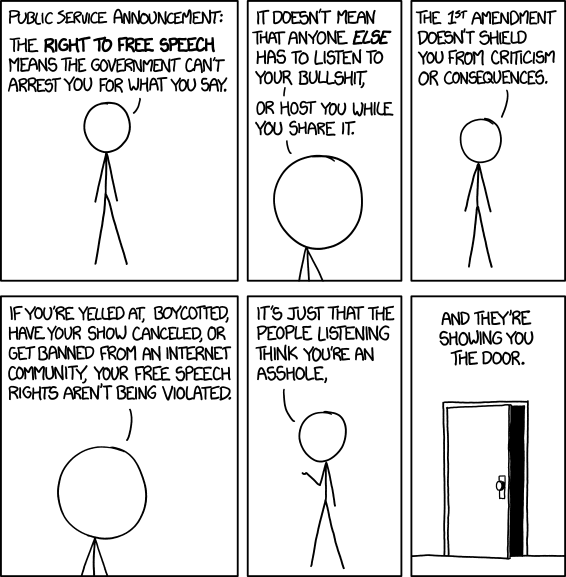 Link to the always-excellent XKCD. This brings to mind the E-mail folder I maintain for my City e-mail, simply labelled “racists”. I get about one e-mail a week that I scan through and send over to this file. 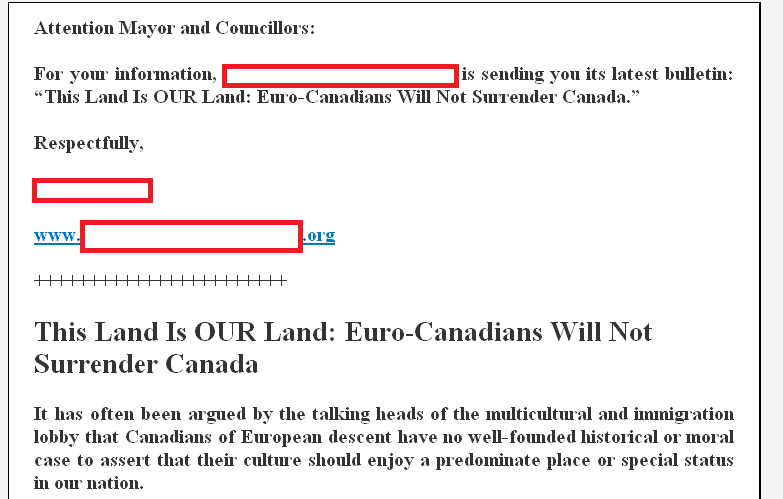 They are all apropos of nothing that is happening in New Westminster, as I suspect the small, hateful group sending them is spamming every elected official in BC (or Canada?) with them. Note, I redacted contact info, and have chosen the headlines of fairly “tame” examples of the 100+ messages I have received. I don’t want to cast light on these groups, but want people to recognize that this ignorant, offensive, bigoted conversation is constantly pressed in the face of elected folks. 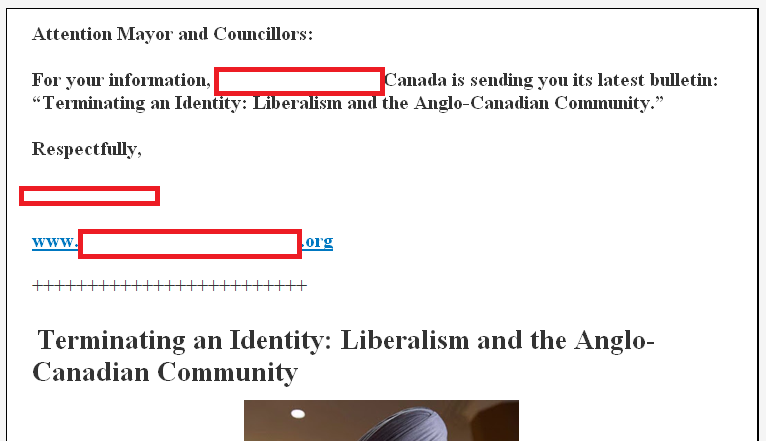 I keep all of these e-mails as an archive partly because I’m a bit of a digital packrat, but mostly because reading these screeds for the last three years has made me hyperaware of the “dog whistles” used for personal gain by people like Kellie Leitch and Ezra Levant, and Rex Muphy, and (unfortunately) in otherwise polite conversation by otherwise well-meaning people. The balance between ignoring it and casting light on it in order to oppose it is the challenge of liberal democracy. Mostly, though, I’m disappointed that so many (especially on the right side of the political spectrum) see society as a zero-sum game; If they want more (from the economy, from their government, from life) then there must be some others who deserve less. We can do better.